The parish and village of Othery, established in 1515, sits on a detached extension of Sowy island on the Somerset Levels. 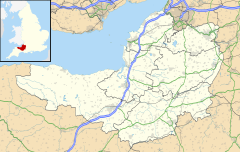 It is 7 miles (11 km) east of Bridgwater and 4 miles (6 km) north-west of Langport. It borders the hamlets and villages of Pathe, Burrowbridge, Middlezoy, Westonzoyland and Aller, which it meets at Beer Wall. The border with Burrowbridge was defined in 1985, reducing Othery to 553 ha (1,366 acres). Many of these borders are defined by rhynes (ditches) and walls (embankments) created and rearranged, from the 13th century onwards, to drain and channel the waters of the River Cary and the River Parrett as they flooded the low-lying levels on their leisurely journey to the Bristol Channel. The name means "Other-island". The "island" of Othery rising above the Levels is a mixed sedimentary and alluvial deposit: marl, Mercia mudstone, sand and gravel ("Burtle Beds"), peat, and deposits from the basin of the River Parrett. The moors on the shallowest deposits are just 13 feet (4 m) above sea level, with the highest hill, on the southwest side of Othery, standing 82 feet (25 m) above sea level. The parish of Othery was part of the Whitley Hundred. Othery once had three pubs, but currently has just one, The London Inn. It had a village shop, a post office, a bakery (Maisey's) and a primary school. There is also a very active village hall. Othery borders two Sites of Special Scientific Interest, both designated in 1985: Southlake Moor and Sedgemoor, to the north of Beer Wall. Othery was a chapelry of Sowy parish with its own chaplain from the 13th century. In 1515, when Sowy was divided, Othery became a separate parish with its own parish church and vicar. The church of St Michael was dedicated before 1203. The church, perpendicular in style, was remodelled in the 15th century, and partly rebuilt after 1844. Its typical Somerset tower was restored in 1849 and in 1853, when pinnacles and niches were built; sculptures of heads and angels were added in the following years. There are five bells in the tower; the oldest dates to the 1650s and was made by Robert Austen. The other bells date from between 1692 and 1815. Roundels of medieval glass, originally from Glastonbury Abbey and depicting the heads of three doctors of the church, have been preserved. Stained glass by Hardman, Bell, and Holland of Warwick was installed in the 1850s in the chancel, vestry, and north transept. The church houses a memorial to the three Chard brothers, who included Colonel John Chard, V.C. (d. 1897), who led the defence of Rorke's Drift, South Africa, and whose father lived at Pathe. It has been designated by English Heritage as a Grade I listed building. The church registers go back to 1560, but the oldest register appears to be a rather poor late 17th-century copy of the original, "crudely arranged in alphabetical order of Christian names and with a gap from K-Q." The Othery Cope, found under the mediaeval pulpit at the time of the Victorian renovations, is an extremely rare 16th-century ecclesiastical robe, restored and now housed at the Glastonbury Abbey Museum. Othery church is one of the churches dedicated to St Michael that falls on a ley line proposed by John Michell. Other connected St Michaels on the ley line include churches built at Burrow Mump and Glastonbury Tor. ^ a b Dunning, Robert (2004). A History of the County of Somerset. ^ "Church of St Michael". Images of England. Retrieved 2008-01-06. Wikimedia Commons has media related to Othery. This page was last edited on 20 July 2018, at 21:54 (UTC).